Hedge Fund - What Does It Mean? 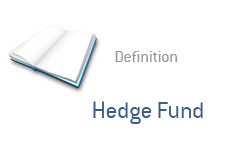 What is the definition of a "hedge fund"? Up until a few short years ago, the hedge fund industry was filled with glitz and glamor. Nearly everyone that was involved in the financial industry wanted to work at a high-profile hedge fund. There was no better way to become filthy rich over an extremely short period of time. Billionaires were created almost overnight. So what exactly is a hedge fund? A hedge fund is basically a pool of money that is controlled by a manager (or managers) and his team of traders and employees. Hedge funds are only open to the wealthy and well-connected. In a typical hedge fund set-up, a hedge fund firm will actively trade a large pool of money that is provided to them by wealthy investors, sovereign wealth funds, pension funds, etc. Hedge fund companies are allowed to engage in forms of trading that mutual funds are not (such as short selling). Hedge funds can also actively use leverage in order to enhance their profits (or losses). Hedge fund firms usually engage in the buying and shorting of equities, as well as options, commodities, bonds, etc. Unlike a mutual fund, hedge funds will require that invested funds be locked up for a certain period of time. There is usually a limited window of opportunity for investors to choose to redeem all or part of their investments. The hedge fund industry is currently not regulated in the United States, although many anticipate that this will soon change. There are as many as 8,000+ hedge funds that are currently in operation today, though this number has been significantly trimmed down over the past couple of years. Many people blame the hedge fund industry as being complicit in the meltdown of the global economy. Capital has fled the industry over the past few years, resulting in the shuttering of many prominent hedge funds. Some of the notable names in the industry include Steven Cohen, John Paulson and Kenneth Griffin. Warren Buffett: Financial Elites Have Wasted "At Least" $100 Billion Over The Past Decade By Following So-Called "Superior Investment Advice"